December 1st, 2010. No. 1 Duke vs. the projected No. 2 Michigan State. Needless to say, it didn’t take much for expectations for this behemoth of an early-season matchup in the ACC – Big Ten Challenge to be sky high. My comrades and I were there three days before, starting the walk-up line before anyone had even thought to arrive. We were there to witness Tom Izzo march his Spartans through the greens of Krzyzewskiville , and greeted them with the warmest of welcomes. And of course, we were witness to a matchup of very good teams – until a freshman named Kyrie Irving – yeah, you might have heard of him – decided to take the game into his own hands. Irving played the best game of his brief Duke career, finishing with 31 points to go along with six rebounds, four assists, two steals, and had no trouble taking senior Kalin Lucas out of the game. That Duke team was defined by its three-headed monster of superstars – Irving, Smith, and Singler – and promised to be a cut above the rest of college basketball. A very different set of expectations follow Duke into this year’s faceoff against the Spartans. Duke lost its top three scorers to graduation and the draft of a league that currently does not exist, and quality senior leadership in Nolan Smith and Kyle Singler. Michigan State enters the season unranked after a subpar 2010-2011 season, which culminated in a second round loss to UCLA in the NCAA Tournament. Regardless, it would be a mistake to expect anything other than a hard-fought battle between Coach K and Final Four machine Tom Izzo. Obviously, K enters the game with the chance to secure his 903rd career victory – which would make him the winningest college coach of all time. 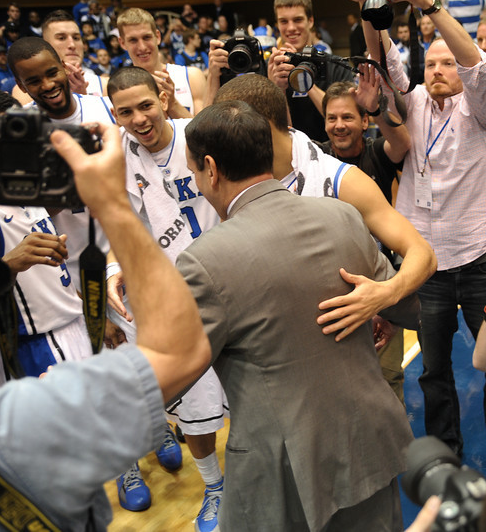 But what will Duke have to do for Coach K to finally claim this milestone victory? Duke undoubtedly has one of the deepest backcourts in the country. In four games thus far, Coach K has unveiled a different arrangement of guards each time. However, it’s become increasingly apparent that when Tyler Thornton is in the game, good things happen both on both ends of the court for the Blue Devils. While he may not be the greatest offensive threat, his 10 points against Belmont on perfect shooting from the floor serve as an indication of his marked improvement as a scoring threat. This budding ability along with Thornton’s intensity and defensive prowess make him the best candidate to fill out the starting backcourt along with Seth Curry and Austin Rivers. Against Belmont, K stuck with a lineup of Thornton, Curry, Rivers, Kelly, and Mason Plumlee for the better part of the second half. Thornton consistently made plays – diving for loose balls, forcing turnovers, finding the open man, and even hitting clutch three-pointers – when Duke needed it the most. 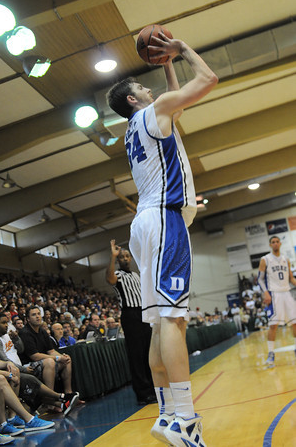 Duke will need Thornton’s experience against a young but talented Spartan backcourt. While Andre Dawkins and Quinn Cook will be able to provide a quick offensive spark, Duke’s best bet in terms of consistency will be to have Tyler Thornton on the floor. Against UNC’s supposedly formidable front line, Michigan State racked up 42 rebounds, with 19 on the offensive glass in last week’s Carrier Classic. UNC was outrebounded by 11 overall, collecting only 6 offensive rebounds all game. The Spartans rebounding onslaught was led by senior Draymond Green, who collected a career high 18 boards to go along with 13 points. For Duke to have success against the Spartans, the frontcourt will need to replicate their performance on the glass against Presbyterian, where the rotation combined for 52 points and 28 rebounds. Duke will need to dominate both the offensive and defensive glass to prevent Michigan State from capitalizing on second-chance opportunities – something they were able to do with relative ease against the Heels. 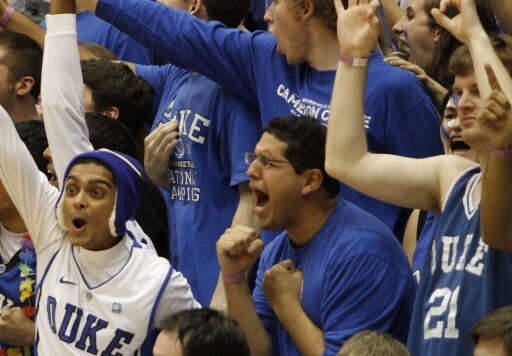 Last, but certainly not least, Duke will need to place particular emphasis on protecting the basketball. The Devils were unbelievably sloppy with the basketball on Friday night against a well-coached, well-disciplined Belmont team. Lacking a true point guard and proven leader on the floor – this was certainly not unexpected, but Duke’s ostensible lack of discipline is definitely a point of concern. 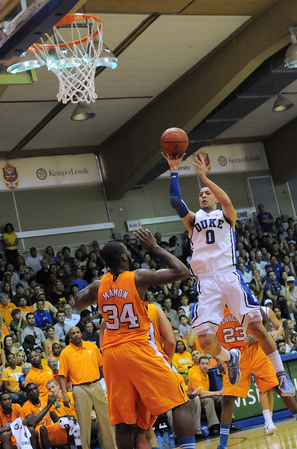 Austin Rivers was especially loose with the ball, netting five turnovers himself, while Seth Curry and Mason Plumlee each had more than three. Against Presbyterian, Duke only turned the ball over ten times, with Rivers, Curry, and Mason combining for only two turnovers. Duke will certainly face a hard-nosed and gritty defense tonight – and taking care of the ball will be of utmost priority. This will be a difficult test for this young team – but it will definitely be fun to watch. How will Duke’s bigs match up against Michigan State’s rebounders? How will Austin perform under the bright lights of the Mecca of Basketball? Who will step up when it matters most? 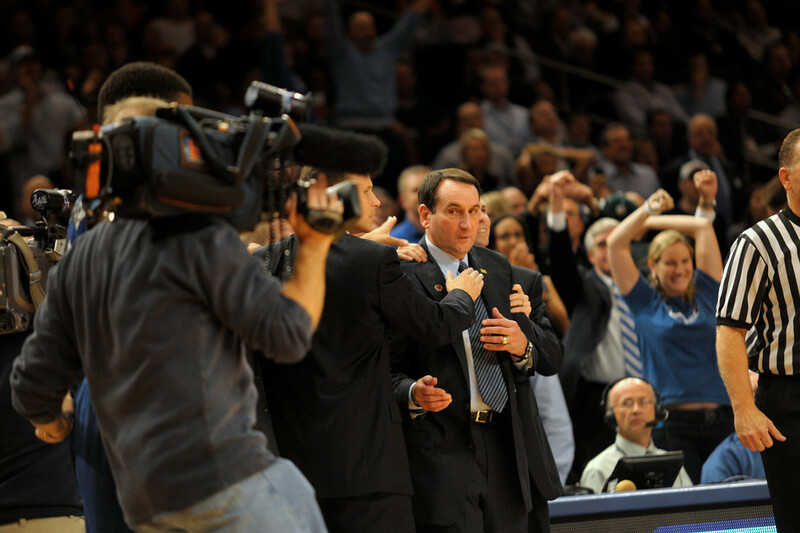 In the end, Duke should end up on top, 70-65, in a hard-fought battle in Cameron North. It should be a good one. As always, stay Crazie! Let’s Go Duke!